For photographer Barbara G. Mensch, the Brooklyn Bridge is more than a massive stone structure that hugs the East River, it is a landmark with a personality of its own. 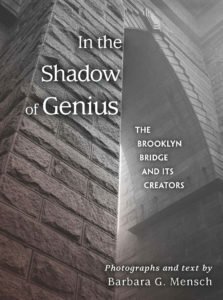 She examines its nuances in her book, In the Shadow of Genius: The Brooklyn Bridge and its Creators. Mensch embarks on a journey back in time, weaving the history and legacy of the Roebling family (the architects of the bridge) with stirring photographs of the bridge that serve to bring the awareness of the reader back to the present day. The Bowery Brothers note that the landmark “follows along with her” as she examines the 1900s building sites that the Roebling family are most remembered for, as well as their beginnings in Germany. She follows the family throughout their lives and highlights their numerous accomplishments, while also delving into their setbacks. In doing so, she forges a path by which the reader gets an intimate glance at the masterminds behind the Brooklyn Bridge. To find hardcover or eBook versions for this work on Amazon, click here.